It's all Local Now Baby! Samurai bones are being brought back from the dead...sort of. Very large numbers of fighters had been beheaded – many almost certainly as a result of trophy-taking practises by the emperor’s forces. In 14th century Japan, victorious warriors often only received rewards for success in war if they proved their achievements by presenting the decapitated heads of enemy warriors to their leaders. Decapitated enemy heads thus became a bizarre currency of a military accounting process which rewarded victors only if they could furnish proof of their military accomplishments. One of the skeletons, looked at in detail by Dr. Wysocki and featured in this Sunday’s Channel 4 documentary, is a probable female samurai. In the 13th and early 14th century, many Japanese women, under the Shogun’s rule, were relatively emancipated, enjoying virtually the same property rights as men, the right to inherit property and were, like men, required to perform military guard duties. And this is of note, particularly since a new student collapsed from medication in my class on Saturday, we called 911 and took care of him. He is doing fine now, thank goodness. 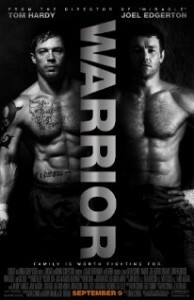 The new movie Warrior is excellent. I'm not linking to the video preview because I think it gives too much away. Here is all you need to know. It is emotionally very well composed, better than "Good Will Hunting," of a few years back. It is the third major film to use a new style of stage combat based on Mixed Martial Arts, the first was the steam bath scene from "Eastern Promises," the second was "Red Belt." The fight scenes are really good. I never knew what was going to happen next and was totally engrossed in the ups and downs of winning and losing and doing the right thing. The theme of the film is fighting for love. Here comes the Hong Kong film festival this weekend! Looking to checkout "Mr. and Mrs. Incredible," and "City Under Siege." Here is some sobering news about China, and a rather dark vision too. If that is too much for you to take in, this funny culture crash story about Chinese religion should brighten your day. I've got some great stuff for you on African American martial arts in the next few days but while you're waiting check out this old master! Oh yeah, and I love this invention!